Although there were several hitches at governmental, technological and economy fronts, still they could not thwart Indian ecommerce industry from flourishing into a powerful industry. There is a tremendous growth in the number of online users and their shopping demands, in last few years. Let’s have a look to the complete scenario of India’s ecommerce industry, its success story and its future. India has secured position in top 10 countries list of ecommerce chosen by online buyers. In a research conducted by eMarketer, it is stated that India crossed $1.08875 trillion of ecommerce sales internationally. It recorded 21.9% yearly growth as compared to 2011 and 19.3% jump in global sales. As per a study, Indian ecommerce is emerging as the biggest B2C marketplace of Asia after recording an increase of 355 and by 2020 it is likely to appear as the central point for startups, investors and entrepreneurial activities. • Since, there is high competition in the ecommerce industry in India, sellers offer great discounts and slashed prices that allures all types of consumers. 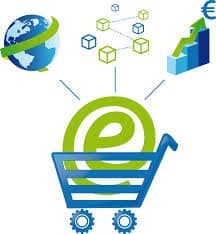 • Since, the logistics solutions are getting advanced day by day making delivery process easier and faster, people are becoming more excited about online shopping. • Ecommerce is growing high when it comes to travel industry. In fact, almost 75% of online shopping is encompassed by hotels booking, air ticketing, holiday packages etc. • Internet progression has made things easier. There are many cities where you cannot find all the brands but then through ecommerce marketing people can easily get to have what they want irrespective of the city they reside. • The growth exhibited by the Smartphone industry has added a lot to the trending ecommerce. As a matter of fact, more than 8,000 new Smartphones are being sold in India and the tablet market is evaluated to have sold 1 million of it in 2013 alone. • With the advancement of new media technology Internet is becoming more and more accessible and faster in the country for everyone that has made ecommerce easier for both the marketer and the consumer. • The increasing advancement in Smartphone technology is promoting e-shopping trends a lot and has significantly lifted the online sales figure up. • The extending mobility has added a lot to the trending ecommerce as now mobile is available even to the rural areas of the country where newspaper or electricity might not have reached yet. • Broadband has become much faster and cheaper resulting into more and more people staying online for a longer period now, which is a good signal for ecommerce consumption. • The success of various ecommerce platforms in India has reinforced the trust Indian consumers have in online buying and selling. • Consumer today accomplish a lot of task through internet whether they are hunting for some information, ordering food, booking a hotel or searching for a job. The average time spent per month has increased from 12.9 to 17.4 and by 2015 it is expected to touch the mark of 21. • The overall improvement in education rate has contributed a lot to the average computer literacy rate. People who are educated are found to do online shopping more than people who are less. • The explosion of social media has made the brands to bridge the gap between them and the consumers, which is a good sign for ecommerce consumption. India has the Facebook’s third-largest audience population in the world after the US and Brazil. According a recent study, there is a large part of people who use internet first time for just using social networks and turn into regular internet users soon. • The changing lifestyle of people in India due to the fast urbanization is also contributing a lot to ecommerce growth. As per United Nations, more than 31% of India’s population resides in urban areas and the shopping needs of urban people are quite more than the rural ones. • Globalization is influencing the socio-economic structure of India to a great extent, which has made the people to think globally and act uniformly. • India has more than 50% of its population below the age of 25 and more than 65% below the age of 35. It is expected that, in 2020, the average age of an Indian will be 29 years, which signifies that a majority of Indian population is youth who are found to be quite tech savvy and not only love to explore internet themselves but also help their families with it. • The product line that these online stores have such as Apparel and other consumer goods is something people are willing to spend on. • The media reach also impacts the buying tendencies of consumers to a great extent and is a chief cause of Indian consumers’ growing inclination towards online shopping. • The way everything is getting digitalized, the confidence and attraction in people to go online to accomplish their multiple tasks getting evoked.